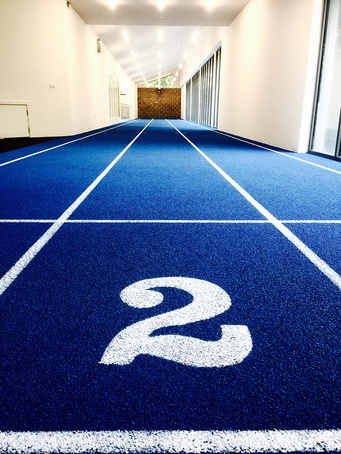 TVS was given the task of providing a 40m, 3-lane indoor sprint track at the new sports and fitness facilities at Bryanston School in Dorset. After thorough consultation with the client it was decided that a highly spike-resistant polymeric system would be the most suitable option. TVS first ensured the concrete substrate in this area was clean, dry, free of contaminants and undulations to within acceptable tolerances. 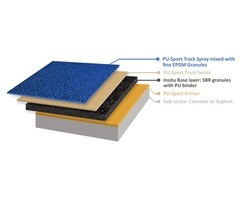 TVS then proceeded to install and seal a resilient pre-fabricated rubber granulate base before broadcasting high-grade blue EPDM granules into a blue resin layer to create the top coat. This system offers excellent shock absorption, performance and a greater lifespan as the EPDM cast can be retextured numerous times. 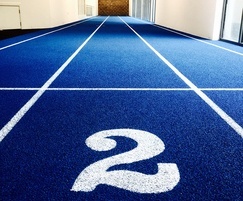 Once cured the lines were applied to create 3 running lanes along with corresponding numerals. To add even more complexity to this project, a force plate was installed with pinpoint accuracy in the centre of lane 2 allowing the sports team at the school to analyse the biomechanical performance of each individual athlete.